Forestry.io hopes to build ‘world-class business’ on P.E.I. Forestry.io is a content management tool for websites. A Charlottetown tech start-up is aiming to be at the “leading edge” of website management. 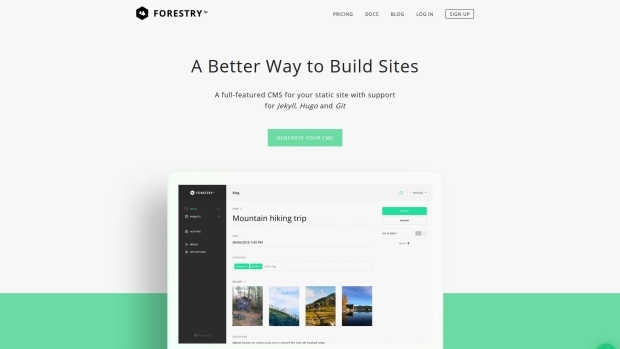 Forestry.io is a content management tool for websites. Once a website has been designed, Forestry.io can be used to keep it updated. Co-founder Scott Gallant says the service only launched four months ago, and it already has 5,000 users worldwide. The company was accepted into the accelerator program Tech Stars, which offered three months of mentoring and $125,000 US in financial support. Six people are employed now with Forestry.io, Gallant said, and they’re looking to hire a programmer, a designer and some administrative help in the next few months. Gallant hopes to eventually take the company public, like Ottawa-based Shopify did a couple of years ago. The Northeast PHP Conference is a community conference intended for networking and collaboration in the developer community. PHP + UX + WEB = The best low-cost conference in North America! It all started with a humble conversation between organizers of the Boston PHP, Atlantic Canada PHP, and Burlington, Vermont PHP user groups. Boston PHP was (and still is) the largest and most active PHP community in the world and had long dreamed of starting its own conference. After almost a year of planning and collaboration between organizers throughout the northeast region, this dream was finally realized with the inaugural Northeast PHP Conference in August of 2012. Starting with no budget and no conference experience, the organizational team overcame many challenges to create an event on par with the big technology conferences. With the event space generously donated by Microsoft’s New England Research and Development (NERD) Center the NEPHP organizers were able to check many large ticket items off their list. Many other sponsors, too numerous to mention here, provided additional resources making it possible to keep the ticket price to an absurdly low price. Most profoundly, all the organizers or speakers not only volunteered their time, but also contributed their own expenses to participate in the conference. While grounded in PHP, the Northeast PHP Conference is not just about PHP. As the organizers know, most PHP developers are working on websites and applications, which means that they need more than just PHP skills to get ahead. The additional Web Technology and User Experience topics help these developers broaden their skill sets and expand their knowledge & experience. As the Northeast PHP team looks to the future there is a strong desire to take the event on the road, traveling throughout the northeast region. With many developers in the northeast region, and not many conferences serving these developers, Northeast PHP can help developers grow and learn, becoming confident and even sharing their own talks. Initially, the team plans to have satellite events in Prince Edward Island with additional locations to be considered in future years. We are entirely non-profit. All money will be used to pay for the conference itself, including food and other expenses required to run a conference of this size. Please show your support and help us create one of the best conferences in the northeast region. We value the participation of each member of the PHP community and want all attendees to have an enjoyable and fulfilling experience. The best way to do that is to get involved and move your ideas forward. Volunteer to join the Conference Planning board, contribute talk ideas, and tell your friends and co-workers! This is YOUR community and YOUR community conference. We value the participation of each member of the PHP community and want all attendees to have an enjoyable and fulfilling experience. Follow @NEPHP on Twitter for updates and don’t miss out on the Northeast PHP Conference 2016 in P.E.I., Canada! Thank you for being a part of Northeast PHP! We’ve got all the rockstars from our industry in one place just for you! With talks ranging from starting to work in the industry to expanding your skill set as an experienced user; we have sessions for everyone! NOTE: This line up of speakers is subject to change.